My intention with Travellers, Seekers & Wandering Ways is to interview an eclectic mix of individuals listening to and following their own inspiration, and learn how—by hearing the story of their wandering ways—they have created meaning in their lives so they may impart their experience to inspire, enlighten and inform others on A Path to Light. Travellers, Seekers & Wandering Ways. Darren Austin Hall, D.Ac. 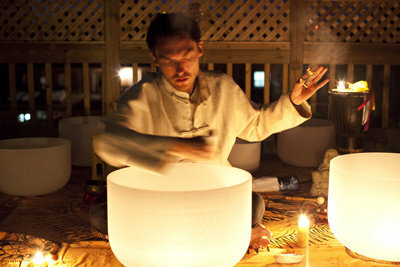 is an Integrated Health Practitioner who specializes in Chinese Medicine, Acupuncture, Sound Healing and inspired living. A graduate of the esteemed Institute of Traditional Medicine where he received his Diploma in Acupuncture and learned under teachers, shamans, and indigenous elders from around the world (even a Druid! 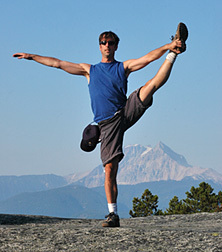 ), Darren brings a dynamic, holistic approach to his practice drawing from many diverse traditions to serve mind, body and soul. His focus is on inspiring patients to transform their lives to align with what the ancient Chinese sages called ‘the way of nature’, echoed by the wisdom of many indigenous cultures that believe living in harmony with the Earth is the essence of living well. Along with his domestic studies, Darren studied Kung Fu and a form of standing meditation called Qigong in China for two years where he worked as an English teacher. Darren also has a certificate in Creative Transformation Therapy that he received after completing a two-year intensive with eminent psychotherapist and ‘American Shaman’, Bradford Keeney, who imparted to him the powerful tradition of Shaking Medicine used by the Bushmen of the Kalahari, perhaps the most ancient healing practice in human history. Darren is also a passionate educator and published writer on health and spirituality and performs sound healing shows under the guise SHEN (Sound Healing ENergy) using quartz crystal singing bowls and mantra with the Chakra model to show people that the best antidepressant is music. He has also worked as a volunteer for the PWA (People With Aids) clinic and is currently in the midst of a two year clinical intensive with eminent Chinese Medicine vanguard, Lonny S. Jarrett.